The next recommendation from the Great Movies – 100 Years of Film book for my screening of Raging Bull is this beautiful and highly enjoyable film from Phil Alden Robinson who wrote and directed the film based on the book Shoeless Joe Jackson by W. P. Kinsella. 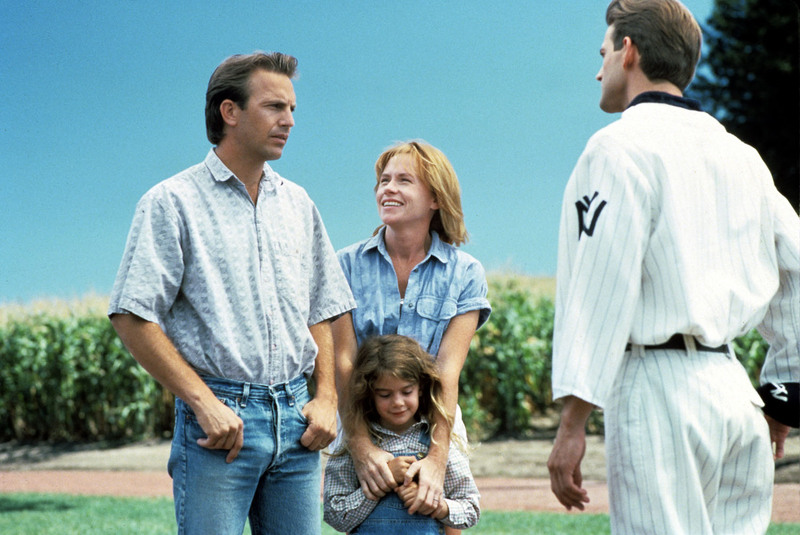 Kevin Costner plays Ray Kinsella, an Iowa farmer, who loves his baseball, and with his wife, Annie (Amy Madigan) are survivors of the 60s, still believing in love, and humanity, though Ray carries some pain over the failed relationship he had with his father. Along with daughter Karin (Gaby Hoffman), the family lives on an expansive farm that is in danger of being foreclosed on. He sees the image of a baseball diamond in his field, and becomes convinced he has to build it. Though not necessarily understanding it, both Annie and Karin take his decision in stride, and despite the music, and movies that fill this section of the film (Harvey, Crazy, What a Day For a Day Dream), he isn’t insane. With the threat of losing everything they love and own hanging over them, the voice has more work for him, including reaching out to iconic 60s writer, Terrence Mann (James Earl Jones). 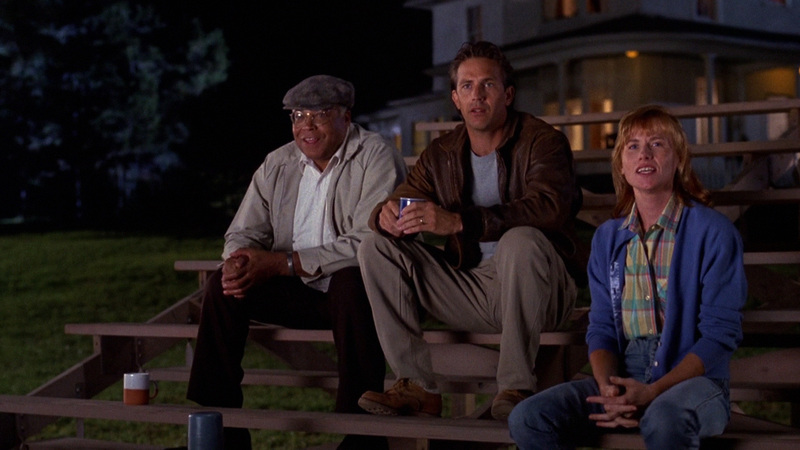 Surrounded by a gorgeous score by James Horner, Ray begins a journey of magic, humor and truth as he travels in time, beholds amazing things, and finds peace, and a lost family connection in this incredibly beautiful love letter to the immortality and joy of baseball, and the love for a man and his family. With a fantastic supporting cast, including Burt Lancaster, Timothy Busfield and Frank Whaley, this film walks a fine line, but under Robinson’s able direction, and Costner’s earnest performance, the viewer happily follows the tale that, if it happened to them, would be questioning their very reality. But that’s the magic of not only baseball and family, but of film. There is such a suspension of disbelief, that you don’t even question what is happening on the screen, though a few of the characters do ask a couple of them. But if you buy into the magic of the film, you buy into the emotion and that gives you an amazing ride. It’s been years since I’d seen this one, and settling into it was almost like watching it for the first time, and it, once again, had a profound effect on me. Is it my favorite Robinson film, no, that’s Sneakers, is it my favorite baseball film, that’s a toss-up between League of Their Own, Moneyball and The Natural, but is it in my top five… you’d better believe it. The film looks beautiful, wears its heart on its sleeve, and will take you the distance… And god, that last scene… like the rest of the movie, is magic, a cinematic home run!